We’re down to the tail end of the gift-buying season and now it’s all about the last-minute. That’s right, there’s only one weekend in between you and a much-needed holiday break. So if you’re like us, this weekend will be spent doing all our last-minute to-dos, including scooping up gifts for those left on your list, wrapping gifts and doing any last-minute décor, cleaning up for holiday visitors and much, much more! But we’re givers here at Speck, so our gift to you on the last Friday before Christmas is knocking one of those items off your to-do list. That’s right, you can stop thinking about what the perfect gift for your office Secret Santa or that cousin you never see is, because we’ve got you covered with our Deal of the Day! 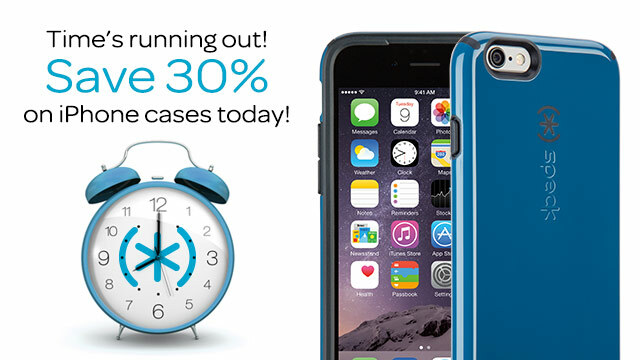 Today’s deal is 30% off iPhone cases and it’s sure to be the perfect gift for anyone in your life. But the clock is ticking to get your gifts in time for Christmas, so be sure to visit our shipping information page so you know when shopping cutoffs are. Want a way to make your gift stand out even more? Send your recipient your favorite App to go along with their new protective iPhone case! Click here to learn how. If they aren’t into Apps or you’re not sure which one they’ll love, try gifting them an iTunes movie, TV show or album. This great article from CNET explains how. Now, with all the time you’ve saved by not having to shop this weekend, take a second to check out some awesome technology stories, starting with big news from Amazon. If you live in NYC and are finding yourself needing some essentials like paper towels, books and batteries, you could get it sooner than you think with the new Prime Now. Check out this article about the new one-hour delivery option for NYC. Making shopping even more convenient, Apple Pay is expanding even further and adding dozens more vendors. Check out this article from CNET to see if your bank or favorite retail store is now accepting Apple Pay. What technology news are you most excited to share with family and friends on Christmas Eve? Share below!